These colorful beautiful ribbon tassels will add a festive touch to all your outdoor or indoor gatherings. Be it weddings, graduation parties or simply adding décor to your home this garland adds just the right amount of accent to any open space. Ribbon garland party hanging decoration supplies for girl/boy/adult. Strings on both ends for easy hanging, you can directly hanging the bunting banner in any place you like, just like on the ceiling, window frame, branches. They're also fabulous to use as a photography backdrop. High Quality: We conduct checks on every aspect of our products. Each material is carefully screened and tested. Material: paper, metal In the shape of a hot air balloon. Color: Colorful, as shown in the images. Easy to Use: They are foldable and easy to transport or to store. It was extremely important for us to make sure that not only are our products of high quality, but they are easy to use. Each paper lantern comes with instructions. 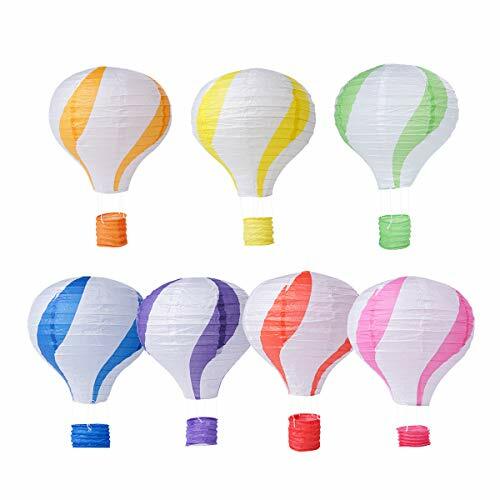 The hot air balloon paper lantern can be easily setup without any hassle. Colorful & Romantic Decorations: Very nice hot balloon decoration, can make people's mood becomes joy at once, because how cute and beautiful they are. Perfect for party, baby shower, birthday, wedding, home decoration, Christmas, Halloween,a large exhibition decoration, shopping malls,decorative activities, clothing store decoration, festive decoration. Also can be used for patio, classroom, Children's Room, office festivals and so on. Note: Bulb and power cord are not included, unfold paper lanterns gently. If you have any questions about this product by CIEOVO, contact us by completing and submitting the form below. If you are looking for a specif part number, please include it with your message.